This past Sunday the readings and the Gospel warned us against vanity and avarice, keeping our eyes focused on heavenly things, not our earthly life. In the Gospel, Jesus told a parable about a man who stores up a treasure for himself; however, “a man’s life is not made secure by what he owns, even when he has more than he needs.” Everything we have on Earth is a gift from God. He wants us to enjoy life, rejoice, and live life to the fullest. But he always wants us to be a people called to generosity, hospitality and openness to life, voluntarily sharing our God-given gifts with our fellow man. There are many forces that want to take over our lives, demand our time, our attention, our worship of objects as false idols. While working to achieve a level of comfort and wealth for your family is not wrong, we should be mindful that these things are not permanent. If it were all taken from you tomorrow, would you like the person you have become? Have you been generous to others? Have you shared your time and talent? Of the man in the parable, Jesus does not say he should not work hard and be successful, rather Jesus points out the futility of hoarding, for it does nothing to advance the man’s spirit. It does not benefit his soul. Occasionally I’ve heard some use the argument that Jesus advocated for the redistribution of wealth. He did require his disciples to give up all their belongings to follow him in an act of ultimate trust and love. However, the true message from the parable isn’t one of people being forced to give to another. While he calls us to live a life of generosity and hospitality, it is our personal, independent choice to follow Him. 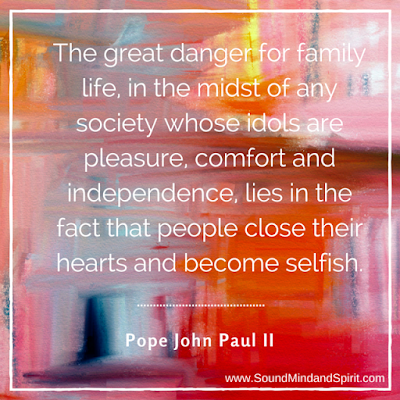 "The great danger for family life, in the midst of any society whose idols are pleasure, comfort and independence, lies in the fact that people close their hearts and become selfish."